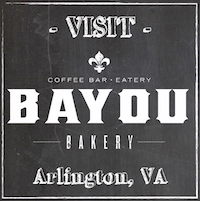 Bayou Bakery, Coffee Bar & Eatery, Courthouse, will remain the original Mardi Gras headquarters with all its decorations and beads for the Arlington community that gets pumped up for the annual Clarendon Mardi Gras Parade celebration on February 9, 2016. The “Krewe” in the kitchen will prepare an authentic parade-goers menu of specialty-priced fare and drinks at the “NOLA” Hour from 6-8PM. PPST! Happy Hour begins at 4pm with Louisiana's own Abita Beer in souvenir Mardi Gras Cups!